Taurus Hill Observatory | Asteroid 76 Freia observed at Taurus Hill Observatory. Asteroid 76 Freia observed at Taurus Hill Observatory. Posted January 3rd, 2008 by Harri Haukka & filed under Asteroids. The spin time of the asteroid 76 Freia is about 9 h 58 min. Asteroid is quite big, diameter about 184 km. Taurus Hill Observatory research team members Veli-Pekka Hentunen and Markku Nissinen measured asteroids light curve about 3 h 30 min. The weather was quite foggy at the beginning of the measurement. The measurements were performed with the photometric R -filter and 120 sec. exposures. 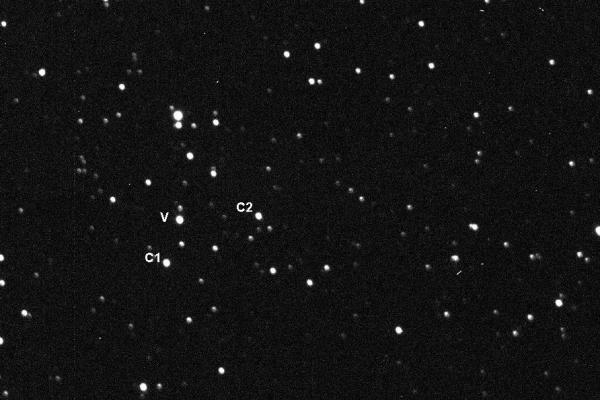 The comparison stars that were used were (C1) GSC 1320-205 and (C2) GSC 1320-151. Observers: Veli-Pekka Hentunen and Markku Nissinen.